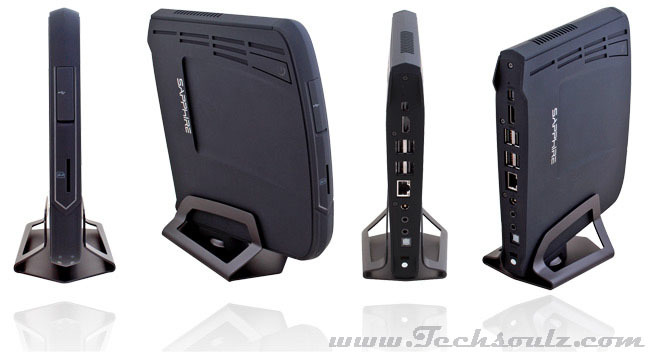 The Sapphire Edge VS8 is an AMD-powered Mini-PC that is really compact. Practically speaking, it is only marginally larger than an external optical drive, and it will slide into notebook bags easily. Because of its extremely small footprint, the Edge VS8 aims to function either as an HTPC or a general-purpose computer. To help achieve this, Sapphire went with AMD’s recently launched A8-4555M APU, which is a quad-core processor that runs at 1.6GHz, and also features integrated Radeon HD 7600G graphics. Supplementing the APU is 4GB of DDR3-1333 memory and a 500GB notebook-class hard drive. One thing to note is that although the Edge VS8 comes fully assembled, it does not come with an operating system installed. Sapphire does provide a CD that has all the necessary drivers required to run Windows 8, 7 and Vista. Additional drivers can be found on Sapphire’s website if one should decide to install older OSes such as Windows XP or even Windows 98. In terms of performance, the Edge VS8 was a little disappointing. Sure, its A8-4555M APU was never going to win any races, but that problem is compounded by its lazy mechanical hard disk. Compared to the Intel NUC Mini-PC, which has a low-power Core i3-3217U processor but a fast mSATA SSD, the Edge VS8 was simply no match and consistently fell behind in our testing. Furthermore, in practical usage scenarios such as web browsing, the Edge VS8 felt sluggish. Even on gaming benchmarks, where AMD would traditionally have the upper-hand thanks to its more powerful integrated GPU, the Edge VS8 failed to garner any sort of a credible lead over the NUC Mini-PC. Fortunately, the Edge VS8 redeems itself in other ways. For one, we are pleased with its generous offering of ports and connectivity options. In total, it has four USB 2.0 ports and two USB 3.0 ports. It also has a HDMI output, which is useful if you plan on using the device as an HTPC. Furthermore, unlike the Intel NUC Mini-PC, it has integrated Wi-Fi and Bluetooth 3.0 connectivity. Considering the size of the Edge VS8, having all these is pretty impressive. As for pricing, the Edge VS8 in our tested conﬁguration costs $699, but there is also a barebones version that comes with neither memory nor storage, costing $579. However, no matter which conﬁguration you opt for, once you factor in the cost of the OS, you are looking at a total outlay of around $800, which is pretty steep considering the level of performance you get. You could get the barebones version and pair it with an SSD, but that increases costs further. In closing, the Edge VS8 is a perfect if all you want do is play videos off it and do some light computing tasks. Otherwise, the steep asking price and limited computing power are signiﬁcant limitations to consider.